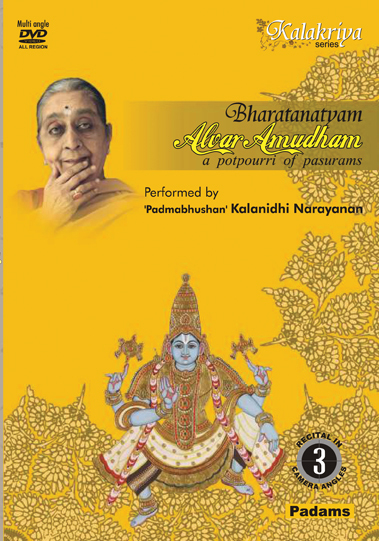 Pasurams, the devotional hymns in praise of Krishna by Alvars, the Vaishnavite saints have been adapted for abhinaya in this product. 'Padma Bhushan' Smt. Kalanidhi Narayanan, the legendary abhinaya exponent demonstrates their creative scope, scale and sweep with 5 pulsating compositions that explore love in its myriad forms and facets. Her devices are simple and commonplace- the eyes, the neck, the head and also the hands that fold and unfold creating a host of characters and articulating a variety of emotions. It is a unique language that natyashastra calls abhinaya! It is an arresting amalgamation of fine lyrics, music, an ageless dance form and the abhinaya skills of a venerable guru. Devaki, the mother of Krishna is wistful that she could not get to see and enjoy his childhood pranks as Yesoda, his foster mother did! A well-dressed Krishna arrives late to meet his beloved. A livid and cold Khandita nayika simply ignores him and his finery.